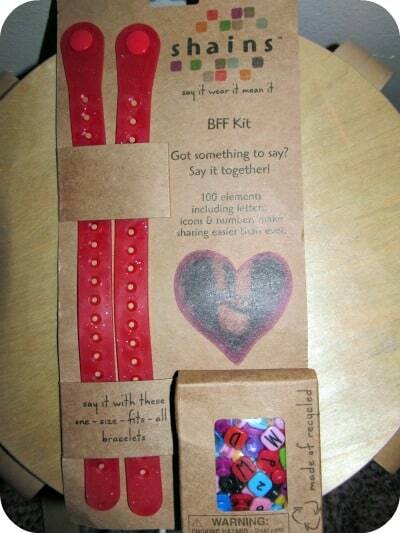 If you are looking for a fun gift idea or stocking stuffer for tween girls then the BFF Bracelet Kit available at Shains is a great choice. Even my six year old daughter loves making her own jewelry and thought it as fun to make a bracelet for herself and her best friend…..imagine my surprise when she informed me that I was her best friend and she had made a bracelet for me! Each kit has 100 letters and symbols so girls can create two special bracelets which will remind them of their friendship bond. The kit includes two bracelet straps, 75 letters, 10 numbers and 15 icons for a truly personalized bracelet. I think that the BFF Bracelet Kit is a fun idea and I can even remember back fondly over 25 years ago when I made a bracelet and swapped it with my own best friend. I also appreciate that the products at Shains are made of recycled materials and can be recycled. 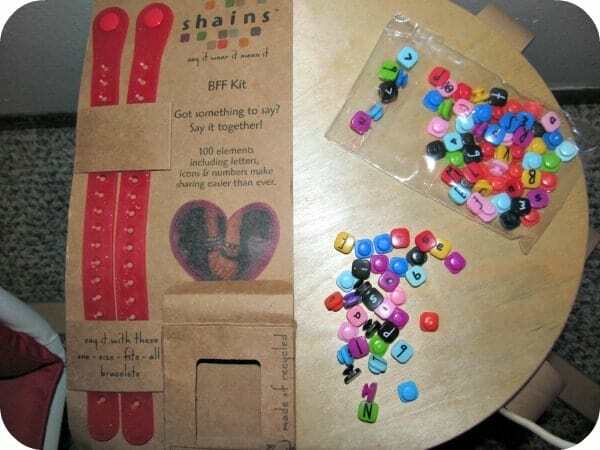 Appealing to girls, the BFF Bracelet kits are vibrant and colorful and easy to assemble. There are three colors to choose from in this kit and it is available for purchase for only $19.95! You are invited to visit Shains™ online to browse the entire collection of products for girls including unique gift ideas such as Glow in the Dark Key Clips, Ponytail Holders and my personal favorite, the Jane Goodall, Save the Animals Kit! There is sure to be something special for young girls of all ages and I had fun browsing the entire selection to pick up some extra stocking stuffers for my daughter, Hannah! would make a wonderful gift for any crafty kid! These look like a fun rainy day craft and that is so cute that your little one called you her best friend! Both my girls would love this … thanks! And how cute that your daughter called you her best friend … love it! I love this! I am going to get these for my niece… She is going to love them!!! These blogs are giving me some incredible ideas that i wouldn’t have come up with on my own! My boys are starting to think I am a cool and crafty momma 🙂 Thank you!